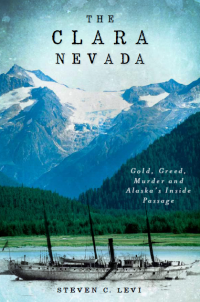 The History Press is proud to announce the release of its first Alaska title: The Clara Nevada: Gold, Greed, Murder and Alaska’s Inside Passage by Steven C. Levi. February 5, 1898. Witnesses report a giant orange fireball reflected in the glacial waters of Alaska’s Lynn Canal. At the height of Klondike gold fever, the Clara Nevada disappeared into an epic storm—taking passengers and priceless cargo with it. Was the explosion an accident or a robbery gone wrong? Did Captain C.H. Lewis make off with $165,000 ($13.6 million in today’s currency) in raw gold? Or was the sinking a case of a sea-weary steamer meeting an untimely end? Alaska historian Steven C. Levi combs the archives to piece together the true account of the Clara Nevada’s final voyage, attempting to solve the riddle of the lost steamer that resurfaced ten years after that tragic night and became known as Alaska’s ghost ship.